Trying to find your organization's Medicare marketing materials? If you prefer, you can also call us at (262) 223-3001. We'll be happy to help! Get the Medicare marketing materials you need to keep clients and earn new ones. 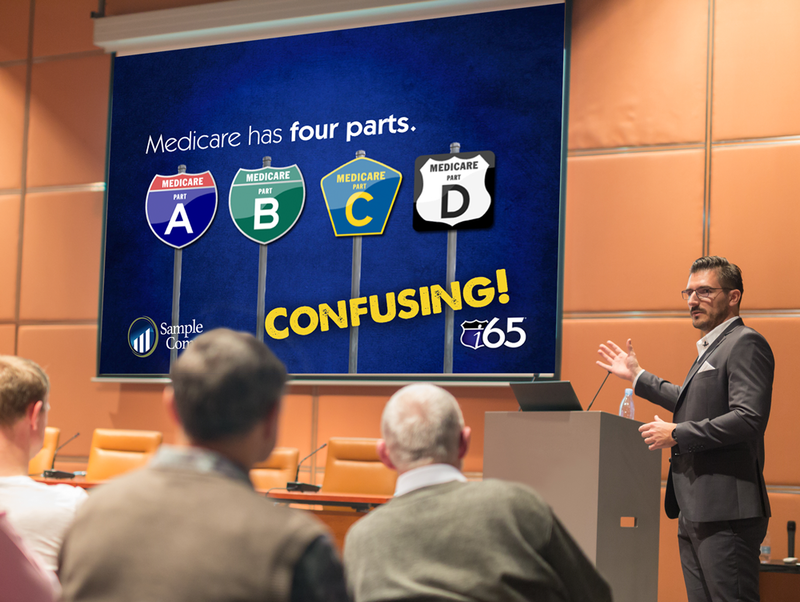 It's easy with these i65® Medicare marketing tools! A popular 1990s movie declared, "If you build it, they will come." Unfortunately, in real life, this just isn't true. You could offer the best widget ever, but if you didn't tell anyone it existed... Well, let's just say the business probably wouldn't be around very long. You have to tell customers what you offer and why the product/service is in their best interest. And, you have to tell them again... and again... and again — which isn't easy or cheap. That's why every level of i65® includes easy-to-use, custom-branded marketing and educational tools. With these resources at your fingertips, it's so much easier to promote your new Medicare offering and your business on a whole. Once you've submitted your logo and preferred contact information, you'll receive Medicare sales flyer customized for you. This simple, yet powerful, marketing piece tells your existing and prospective clients alike that you can provide unbiased, expert Medicare guidance. Let's be honest. Some clients don't take Medicare enrollment or annual plan reviews as seriously as they should. Luckily, you'll have four real client case studies demonstrating exactly how expensive Medicare mistakes can be. Best of all, these case studies are already customized for your use, including your company's logo and contact information. Nothing... and we mean nothing... draws a crowd better than Medicare. If you're targeting the retirement market, it's critical you be able to provide a seminar on Medicare. i65 provides you with the absolutely BEST presentation anywhere. It's visually stunning. It uses a road metaphor to make Medicare very easy to understand. And, like all other i65 marketing materials, it's customized with your logo. With the Pro level i65 package or higher, you'll get access to the library of "Medicare Milestones" brochures. The tag line of each four-page issue is, "Unbiased, Clear, and Concise Information for People With Better Things to Do Than Spend Hours Learning About Medicare." And, we mean it. Each issues of Medicare Milestones presents your clients with only the most crucial information related single Medicare subject, such as Medicare Part D drug coverage or the three Parts (A, B, D) of Medicare, etc. Whenever possible, information is presented in charts, graphics, bullet lists, etc. to keep clients interested and engaged. We recommend delivering these issues one-at-a-time over a 6- to 12-month period before your clients turn 65.